To the west of St John is St Mary, which is quieter and more rural than its neighbour. There are no village shops (the petrol station has some groceries and newspapers) there are few housing developments and there is no real centre of village life. However there is a modern recreation centre adjoining the elementary school, with a small football pitch and tennis courts and an indoor sports facility. Instead of nestling together as in other parishes, the parish hall, the elementary school, the two churches and the one restaurant/pub are strung out along two main roads. 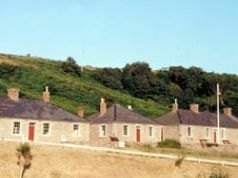 The houses in St Mary are mainly beautiful converted granite farm houses with large gardens. There are cliffs along its north coast with a sheltered wooded valley running down to its largest beach, Greve de Lecq, a beautiful sandy cove with a small pier, a couple of hotels and a good and popular beach café.